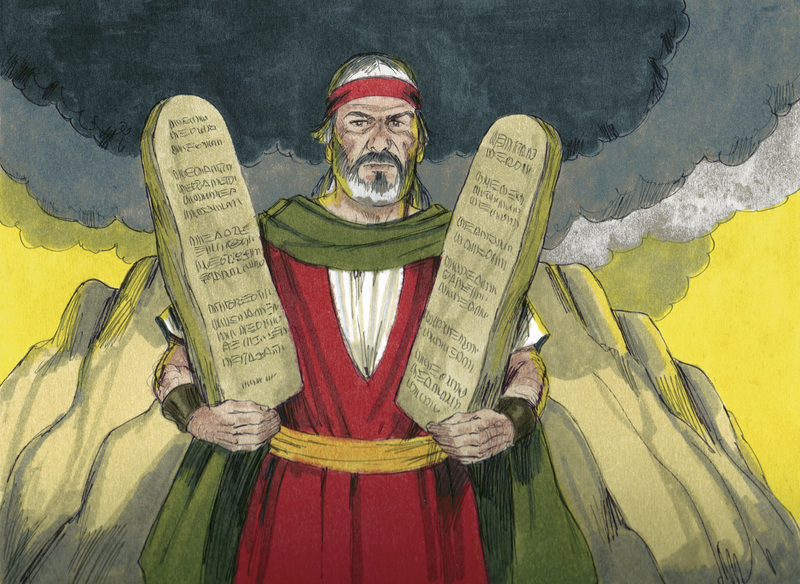 Today we see Moses present the decalogue or the ten commandments or the directions or teachings for the Israelites to get along. Certainly they were not taken as absolutes but as guides to the will of God. They in no way could address every moment or direction in a person’s life. Even today we have a tendency to water down and justify and make excuses and exceptions to absolutes with all kind of circumstances and reasons for making things less absolute. Jesus set a whole new meaning to life with his law and direction to love. If we truly believed in loving as the direction of our life and our actions, the world would be a different place to live in. If we could really love others as much as we loved ourself much would change. Unfortunately, there are many who don’t even know how to love themselves much less care for others. This is why sometimes directions or guidelines are needed. In the gospel today, we see a different Jesus. The Temple for the Jews was a holy place, meant to house the Ark of the covenant and God’s very presence. 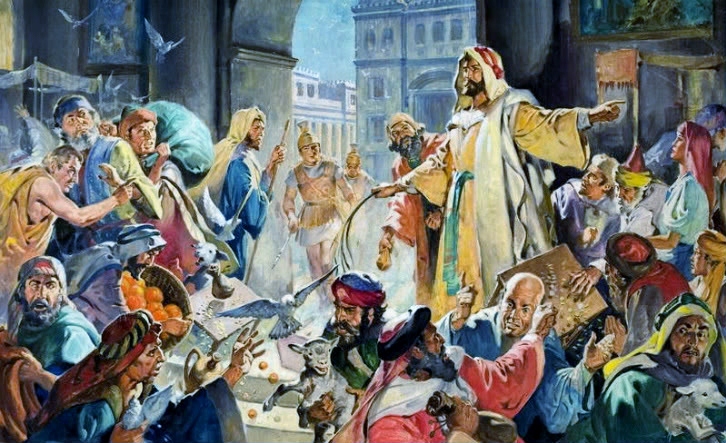 Money changers, animals, and all kinds of sellers and businesses were there looking to make a profit off the worshipers coming to the temple. It was really a marketplace. We so often picture Jesus as a mild loving man, gentle and loving, touching the poor and sick and healing. 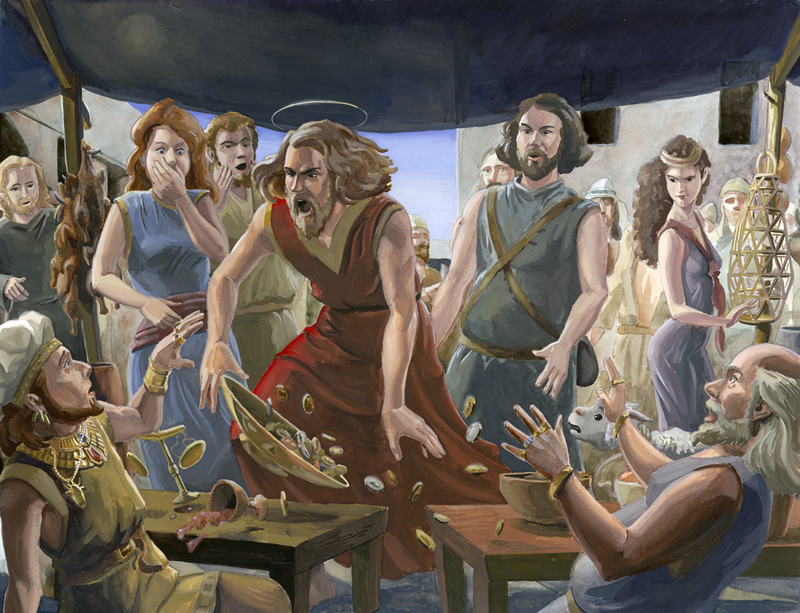 Yet today we see him scattering coins around, turning tables over, chasing animals out of the temple courtyard. He was even using a whip to chase away the men. Imagine the chaos and consternation of the people. His zeal and righteousness for his Father’s temple was complete. But when he was challenged, he referred to a new different temple, the temple of his body. Suddenly we see that now there is a different temple in Jesus’ church. 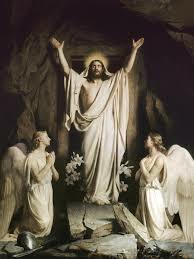 It is his body and to be resurrected body, present and given to us in his Eucharist. He has told us he remains with us and has given us his Spirit, but also we have his body and blood in the Eucharist to have and to share. Think of the irony of that. We build churches, cathedrals and monuments, all to house our faith, but the real temple or building is Jesus himself sealing and uniting and embracing us in his very body and blood. The time, the place matter not, for he said where 2 or 3 are gathered in my name, there am I. And there it is, our zeal, our care for God’s presence is in how we love and how we share and consume Christ’s body and blood together. The truth is that the more we love the more we become like him. We have to learn to find Jesus in the person of others, and dispose of our money changers and distractions that get in the way of our faith driven love. In a small way we then share and bring Christ’s love to others. Our gospel today begins in the evening of Easter Sunday. 10 Apostles are huddled together in the same upper room hiding from the Jews and Romans pondering and discussing all that had occurred including the events of the morning, Mary’s report, the mad dash and the empty tomb. Their grief and fear were strong and the whole week was mind altering to all of them. Certainly, a kernel of faith and love was in their hearts, but their fear, their flight, their hiding was still overwhelming. They all had a sense being lost. They frankly were probably in a real state of confusion. And then in their midst a familiar man a familiar voice. No judgment, no rebukes but a simple Peace be with you. This peace was a joy wish, an act of forgiveness and of love. His hands and his side proved it was him. 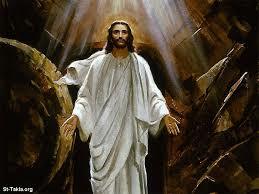 He was alive, he did rise. He not only gave his peace and forgiveness, but he gave his Holy Spirit so that they became empowered in His love to forgive the sins of others. Can you imagine the change, the beginning of a new understanding? Sure there was a joy but the resurrection event was not yet over. They were not quite ready. Look at the second part of the gospel, they couldn’t even convince Thomas, one of their own, that they had seen Jesus. If they couldn’t convince Thomas, how could they go out beyond the doors and face the world. Certainly, people would be more skeptical than Thomas. Thomas had to see for himself. Lucky for him that Jesus was still around and being seen by his disciples. This resurrection event was to carry on for several more days. Faith and certainty are not always present together. Yet Thomas received them together. But as a task he and the other Apostles were told to go out and spread the faith to others. Obviously, Faith comes out of the love of Christ and can be introduced to others through a living out that love, but ultimately faith is a gift of God which each person must come to accept or reject. While Thomas got to personally see the Risen Christ and come to believe, each of us in truth have had or will have our own moment of recognition when we fully come to see and believe with our own “My lord and my God”. On the other hand, we must realize that to believe is not enough. Life is not a moment or a simple I believe. Our faith calls for us to live it out, to love as Jesus shared in his time and ministry. 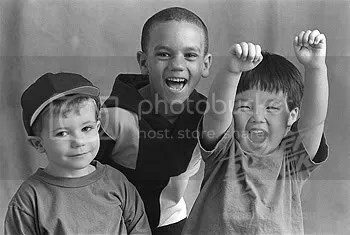 Loving in word and action, forgiving and getting along working to glorify God by seeing him in each other. All of us are not unlike the apostles. We too have fear and we too could turn and run when a difficult time comes. We could flee to a place apart as the apostles did. We too could betray the love that has been given us. The most important thing here is that we must get out of that dark place and seek once again the love and forgiveness of Jesus. No matter what we do, He is there to simply say Peace be with you, offering the same peace and forgiveness and assurance he gave his apostles. Reflection on the gospel reading: I believe Jesus was bodily resurrected from the dead, and it is this fact that makes of all material reality a poem and imbues it with lyrical meaning. 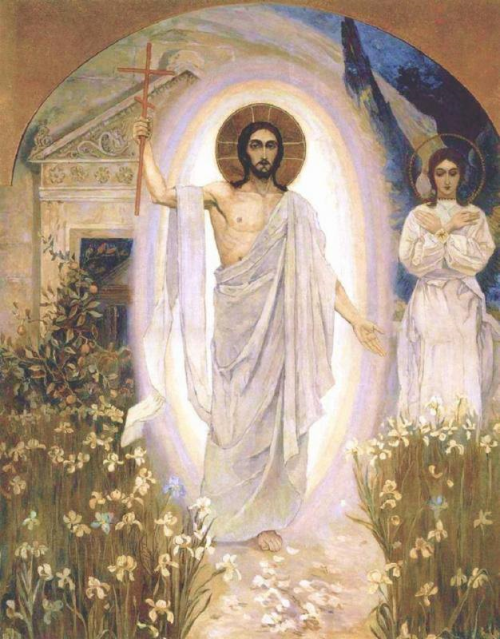 The resurrection of Jesus shows that the material world is a sheer veneer that covers shimmering truths; it is a course veil spread over what is brightest and truest: those mysteries that abide beneath the surface of what we see, taste, touch, hear, and smell. The resurrection of Jesus testifies that the things in the world of the senses, the things that we can measure, are absolutely true still but not the most real reality. Jesus’ resurrection pierces the veil to reveal the freshest deep down things that lie out of sight just beneath the surface and makes us see that what is true is seemless, that the surface things of daily life and the deep down things of mystical experience are really and truly one and the same thing. The resurrection of Jesus teaches us that the promise of life is that just as we now see, taste, touch, hear, and smell to sense the surface, one day we will throw away every illusion and abide in what for now is the mystery beneath the surface. I would like to begin today with the short reading from St Paul about yeast. My family used to make sourdough bread, just as the Jews would do. They would break off a lump of the sourdough, mix it with flour and it would ferment and create a new batch of bread. While this could go on for years, and did in my family, Jews were asked to start a new batch of leaven every year at Passover time, probably signifying symbolically a new start after they celebrated being released from slavery in Egypt. So, at the Passover, having destroyed or gotten rid of the leaven, they ate only unleavened bread, what we would call flatbread today. Paul starts with this image which would have been familiar to all his readers, and he asks them to start over and clean out the old yeast and start afresh. He says that they and we are like unleavened bread now. Jesus has purified them and taken out the leaven that was old and tainted, and before being leavened we all must start again, having thrown out the old world order of malice and evil, like they did the old yeast, and begin again with sincerity and truth. If leaven causes bread ( and us) to rise, it is Jesus who will also cause us to rise… with him! Our first reading from the Acts of the Apostles is a homily of Peter in which Peter summarizes for the crowd the elements of Jesus’ life, death and resurrection. He first speaks of John the Baptist’s baptism and how God anointed Jesus through the Holy Spirit to do good and heal. Despite this, Peter says they put him to death on a tree. 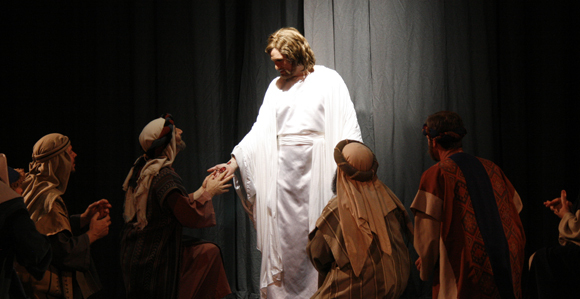 But God would not let him die and raised him up on the third day. It is clear in the homily that Peter believe in the Resurrection simply because he was a witness to Jesus and ate and drank with him after his death. Finally he states that the resurrected Jesus commanded them to spread the news about him by preaching, especially by using the Scriptures and especially using the prophecies. 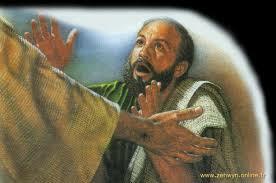 What Jesus brought, Peter says, is forgiveness to all who believe in him. Finally, today, St. John combines the supernatural with the ordinary in his Gospel account of the Resurrection event. It is quite a delightful narrative really. Mary goes in the dark to the tomb. We are not told why she went, simply perhaps to mourn. She couldn’t have gotten inside the tomb by herself because there was a large stone closing off the entrance. But when she arrives she realizes that the stone has been moved. She doesn’t go into the tomb, but races to Peter and to one other apostle – simply called “the one whom Jesus loved.” This unknown person is referred to as this six times in John’s Gospel. As a side note to the story itself, it has been debated for centuries who the beloved disciple really was. Most seem to think it was John the apostle -supposedly John the Evangelist himself. Others say that John the apostle would have been much too old when the Gospel was actually written. Other commentators favor Lazarus as the disciple, since when before Lazarus died his sister talked about how he whom you loved is sick. Lastly, among many others suggested through the centuries is the rather recent theory that Mary Magdelene herself was the beloved disciple, though how that can be reconciled with the text that Mary ran to Peter and the other disciple, I have no idea. Let us continue wight he story, however. 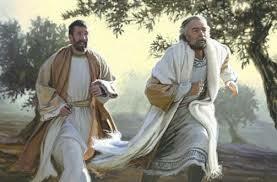 The beloved disciple, being apparently younger and more agile got to the tomb first, but in deference to peter, waited till peter got there before entering after him. You may have noticed the details that the writer mentions – the linen wrappings on the ground where they had fallen off, the cloth that covered the corpse’s head in another location and rolled up. What do these details indicate? They are both ordinary and yet strange. Would not have someone who carried out the body have kept these coverings to hide the body? The body moved around because the coverings were in two different locations, and while the sheets had just fallen off, someone took the time to roll the linen facial cover. In any case, the younger disciple seemed to figure it our and believed what had just happened. Peter may not yet have understood because of John’s statement that they didn’t understand how the Hebrew scriptures indicated he would rise from the dead. 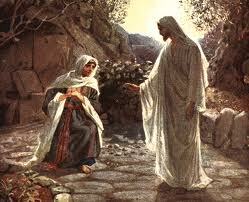 Mary had come with them to the tomb but did not go in. After Peter and the disciple left to go back home, Mary was left crying at the tomb, and she looked into the cave and saw to figures in white sitting at either end of the tomb itself. They speak to her and ask why she is crying and her reply is simply that somebody must have taken the body and she doesn’t know where it has gotten to. Imagine what you would feel if you went to a grave of a loved one the next day and saw that someone had stolen the body! As she turned away she saw someone she took to be the gardener of the cemetery. I love this image because if Jesus is seen as the new Adam, isn’t it appropriate Jesus be seen as a gardener because really that’s what Adam was in Paradise – the groundskeeper of Eden. Now here is where it could get eerily supernatural. Mary didn’t recognize Jesus! Instead she almost blames the gardener for carrying away the body and demands to know what he did with it. When Jesus speaks to her, though, and calls her by name, she immediately recognizes the voice, calls out “Teacher!” and holds on to him. 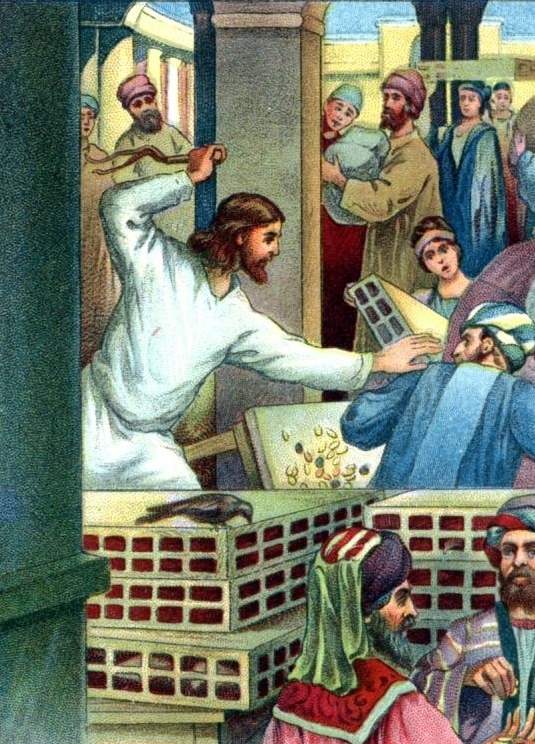 Some translations give a wrong sense of the resurrected Jesus being breakable or fragile, saying “Don’t touch me!”. But when Jesus says literally – “don’t hold on to me” – he is probably more referring to having work to do because he hasn’t ascended to the Father and that he can’t be so detained. So Mary hurries back yet again to tell them the news – she has seen Jesus! To me it is significant again that it is to a woman that Jesus first shows himself, just as we saw a few weeks ago, it was to a Samaritan woman that he first revealed who he was. How unlike what would ordinarily be done in Jesus’ time! God’s ways are not ours as i so often remind you. The Resurrection is a supernatural event, hard to believe especially in our era when we do not believe it can happen according to the laws of science. And yet, i am sure that none in Jesus’ time could believe it either. Our own experience tells us not to believe. But for the early church belief came very quickly and was widespread. The simple telling of the story and the every day details show that it was part of the fabric of their lives when they wrote it down. St. Paul tells us that it is central to our faith, that the cross was not enough. Without the resurrection Jesus turns into an ordinary man, a great prophet and healer perhaps, but could hardly be the impetus of faith for so many people for 2000 years. Yes, it is hard to believe, but I do believe it. And I do, precisely because I don’t understand God’s ways. And the more i read, the more I learn, the more I debate in my mind with all the naysayers, I keep coming to the same conclusion that I hope you do as well. Jesus is God, and it is by looking at the physical manifestation of God in his human form that we know how to create the kingdom of God on earth with him. That is the Good News. That is it in a nutshell. And as i always end my homily with the same statement about the goodness of the Good News, let me pray today that this Good News of the Resurrection bring you to a knowledge of God and his kingdom on earth and heaven so that like the yeast, you may rise with him and be the yeast for the rest of the world to feed on in days to come. Truly Good News. Happy Easter to you all.